Below is my info and experience, your mileage may vary! Click here for a GIF image of the blueprint that I created to make a ONE OUNCE pot support in about 10 minutes, or click here for a picture of the stove components. Have a look at GreatOutdoorsDepot.com or BoundaryWatersCatalog.com for a pictures of the Trangia burner with stand. I threw away the standard (heavy, bulky) pot support in favor of a MUCH lighter and smaller homemade one that requires only aluminum roof flashing and scissors or tin snips. The stripped-down burner weighs 3 oz, the flame adjustment piece weighs 1 oz, and the pot stand they sell you for $5 weighs 6 oz. Use an MSR-style windscreen around the whole thing, but cut some slots in the bottom of that also so you can let in more air. When the wind is blowing, tighten things up a bit. When it's NOT blowing, if you smell alcohol during cooking, that's a sure sign the stove is not getting enough air. It burns MUCH hotter when there is some draft over the burner unit, but also burns off the fuel much faster. With too little air, the flame gets really tall and blue, and you get the smell of unburned fuel being boiled off and wasted. The Europeans call this a "storm cooker", and in a windstorm it really DOES cook! As of 1996, MSR was the only US importer, but they tend to avoid selling it for some reason. MSR will sell direct, but they warn you that their shipping delays and prices are higher than normal retail channels (see links above). Prices for the Trangia stove seem to be based partly on the cookware that is bundled with it, and partly on the retailer's profit margin. THE BURNERS ARE ALL THE SAME - the only difference between models is the pot support and cookware. I've seen as high as $84, and as low as $10, but MSR assures me that Trangia only makes one model of burner. (Campmor claimed otherwise, but then again their catalog is dead wrong on both weight and boil time.) Piragis/BoundaryWaters calls what I bought the "Trangia 23", as opposed to the "Trangia 28" that Campmor sells. The "28" includes a 0.8 liter pot, while the "23" is just the burner and a circular pot support that packs poorly. MSR said that what Piragis/BoundaryWaters described as the "23" was really the "Westwind", so you should make the seller be very specific about what is included in your order! MSR says the basic burner weighs 6.6 ounces, and the triangular support weighs 2.8 ounces. Nope. That's not what it weighs on MY scale! (3 ounces for the burner) By comparison, an MSR XGK (with pump and 0.5 liter fuel bottle) weighs 15 ounces or more. Home Depot (or any other hardware or paint store) usually has denatured alcohol by the gallon in the paint thinner section. "Denatured" just means it's 100% (200 proof) grain alcohol that's been poisoned with a bit of petroleum so you'll get sick if you drink it. Quarts are sold also, but they are MUCH more expensive. If the gallon size is not in stock, yell at the front desk and wait. A gallon is roughly the price of two quart cans ($7). Some literature says it will only burn long enough to boil 1 qt of water with the normal 3oz of fuel it holds. Bunk. Boil one cup at a time. MUCH more efficient - doubling the amount of water will TRIPLE the boil time. This is a personal stove, not a group stove, so just do what you need, then use that while the next cup is heating. Put the top ramen or minute rice in the water BEFORE it boils, and you won't have to simmer after it boils. Get an MSR windscreen or equivalent, and size it to just fit around your pot. Using tricks like that, I got thru a 3 day trip with hot breakfast and dinner on 3 ounces of fuel... and on extended (9 day) trips I average 2 ounces of fuel per night cooking real dinners (angel hair pasta) each night and having a couple cups of hot drinks each morning and evening. boil time doesn't agree with MSR or my own observations. websites show 7 minutes to boil a quart, others show 22. REI is in the middle, but that doesn't make them accurate. >REI's comparison chart is revealing. bought MSR the same month they dropped the big Optimus stove. in the stores I've visited. Piragis sells them for $10, REI for $25. How much do people pay for MSR stoves? What's REI's profit margin? the stove for the RIGHT size of pot or it's not efficient. - If you try to boil 50 gallons on the MSR, it will never boil. before you know it's boiling. should have the same optimal pot size? Don't forget that most people start a stove several times a day! should be counted PER CUP in a test rigged to favor the Trangia. Heat a cup, shut down the stove. Heat a cup, shut down the stove. MSR would be no more efficient than the Trangia, maybe worse. an MSR stove. Look at the weight benefit and it's even better. >in about 1/3 the time of the Trangia per REI's "controlled" specs. main course. The Trangia simmers well, also. you will try to distort the specs to favor your own products. gas (in my Optimus) or alcohol (in my Trangia), on 9 day trips. variation between people than between stoves. Much more! dinners like ramen and capellini. No freeze dry. >attractive for both the stove and the fuel. The fuel is about the same price as white gas, $7/gallon. >How long will it burn on a fill of alcohol? I've never tested that. I'm not sure it would be a good metric of a stove. the fuel line has to empty after you shut it off). stove, so even if it uses slightly more fuel it's still a weight savings. to eat at the same time or even camp close together. Trangia wins. gas, so you'd expect to use a bit more for the same amount of cooking. bunch of fuel over boiling the whole quart.) This one is a draw. fail in the field, I've seen close to a dozen MSRs fail in the field. stock what they don't sell, and they DO stock LOTS of MSR repair kits. failure mechanism other than a bear carrying it off in your food bag. I tested an MSR wind screen and blew the fuel tank pressure cap. Oops. >burned off all of the alcohol? at REI. You can do that with alcohol, I wouldn't do it with white gas. 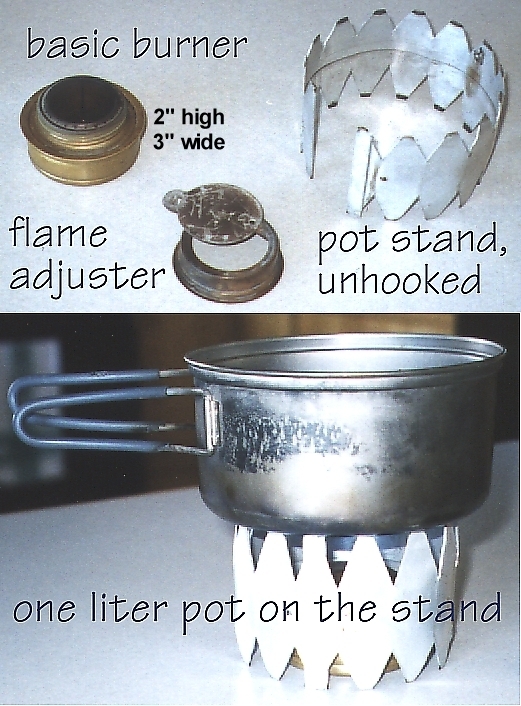 alcohol stove could be fatal. >design of the pot stand that comes with the stove changed? than the original. The short answer is 'yes, the height is intentional'. doesn't, so err on the side of a little extra height for the stand!